Agrimotion strives to set the standard for best practices in soil management and fruit production, through ethical and sustainable solutions. 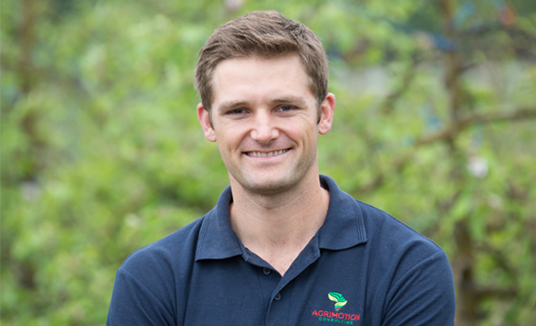 Agrimotion commits to provide an independent, unbiased consulting service to the producer through practical and scientifically sound recommendations. Our goal is to build meaningful partnerships with clients whilst striving toward a common goal of achieving long term profitable yields. 2017 to Present: Nutrition/soil management and new orchard developments for the ACG group (Table Grapes). 2016: 100ha soil survey and new orchard development for Mouton Citrus. 2015: Anadarko, Mozambique, Evaluation of soil potential for relocating small scale farmers. 2017: Developing detail drought management strategies and water budgeting systems for the Suiderland citrus and table grape farms. 2014 to present: Irrigation scheduling and training on over 650ha of table grapes and citrus for the Suiderland farms spread across the Western Cape. 2017: EXSA table grape study group, Grondbestuur in toekomstige en bestaande tafeldruif blokke. 2016: Combined Congress, Bloemfontein, The pedogenesis of bleached topsoils overlying weakly-structured subsoils in the Western Cape and Mpumalanga Provinces of South Africa and their significance to classification. AWARD: Best publication for a researcher younger than 30. 2017: Macs in Moz, Mozambique – Soil classification and assessment for macadamia, litchi and avocado orchards (±1500ha). 2016: Musahamat Farms, Ghana, Soil classification and assessment 230ha Banana Plantation. 2016 to present: Irrigation scheduling – pome and stone fruit (Graaff-fruit, Arborlane Estates). 2017: Combined Congress, Bela-Bela, The effect of composted biochar on compost properties and mineralisation. 2016: Consulting Lecturer – Chemistry, Biology and Soil science, Elsenburg Agricultural Training Institute. 2016: RUFORUM Biennial Conference, Stellenbosch University, Importance and application of post-graduate research in the field of soil science. 2017 to Present: Assistance in soil reconnaissance and classification conducted by Agrimotion Consulting. 21 years’ experience in managing data collection and management from farmers. Leaf sample analysis scheme which coordinates the collection and sampling of 3000 leaf samples from over 100 different farms. Data processing and technical support for all consultants. Since completing his articles at PwC in 2003, Jimmy has worked in various financial and executive roles at national companies across the financial services, property and healthcare sectors. Jimmy holds a B.Acc degree (Stellenbosch), a Hons.B.Compt degree (UNISA) and is a Chartered Accountant (SA). He also completed the SAPOA Property Development Program (University of Cape Town, Graduate School of Business). Rob holds a B.A. (Legal Studies) and has dealt with Human Resource issues for over 25 years. His experience is diverse, having advised from start-ups to listed entities across various industries. Rob’s passion lies in assisting businesses to grow: discussing practical solutions along the way and applying them strategically throughout the enterprise’s journey. Dean has over seven years of industry experience in various positions ranging from Finances, Climate Change modelling and Agriculture. With a passion for how the world works spatially and technology, GIS is the perfect combination of both. Dean completed a GIS Hons Degree at the University of Stellenbosch. Kate joined Agrimotion in 2018 as the team and research assistant. She is the administrative contact for our Somerset West office and assists all of the consultants with office based matters.